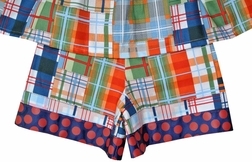 We adore this red, navy, white, red and green multi color Madras fabric by Michael Miller. Makes you think of the beach, sailboats, lazy days and of course fishing! 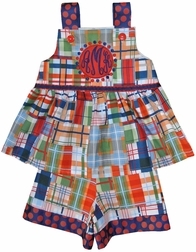 Here is our girl's outfit to coordinate with brother's appliqued 3 fish madras John John and shorts set. We start with a square neck dress/swing top with navy and red dots ribbon as the shoulder straps. The dress/top is made with the madras fabric and has a bodice with a gathered skirted bottom. Between the bodice and the skirt portion we have sewn navy ribbon with red tatting on the edges. 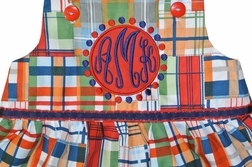 The swing top is paired with madras shorts or capris that are trimmed in the navy with red dots ribbon. The special feature of this little outfit is the appliqued red monogrammed round shape in the center of the bodice. The monogram is framed in little dots all around. 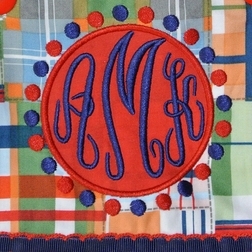 THE MONOGRAM IS INCLUDED WITH THE OUTFIT AS IT IS THE CENTER OF THE DESIGN.